Digital City Wien » WeAreDevelopers Congress: Win a free ticket with DigitalCity.Wien! HomeEventsWeAreDevelopers Congress: Win a free ticket with DigitalCity.Wien! 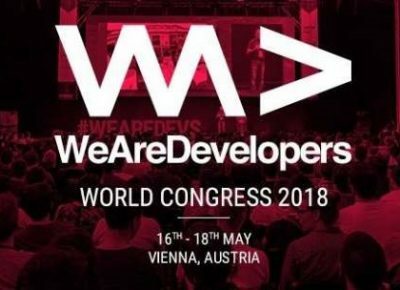 WeAreDevelopers Congress: Win a free ticket with DigitalCity.Wien! Along with WH-I, Wirtschaftsagentur Wien, Digitales Wien and DigitalCity.Wien, the City of Vienna will also join this amazing experience. Have we peaked your interest? If you’re wandering what it’s like to be part of this years‘ congress we have good news for you: DigitalCity.Wien is giving away a ticket for the 2018 WeAreDevelopers Congress! All you have to do is send an email at digitalcity@urbaninnovation.at. The quicker the better – we’re keeping our fingers crossed!